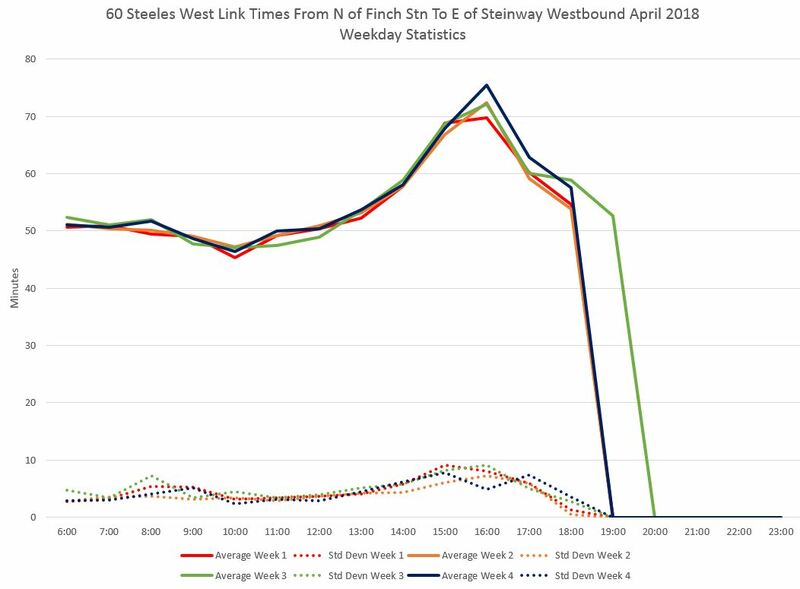 In the first section of this article, I reviewed the headways on 60 Steeles West which, to be charitable, are not particularly reliable, especially west of Pioneer Village Station. In this article, I turn to travel times along the route and how they vary by time of day. 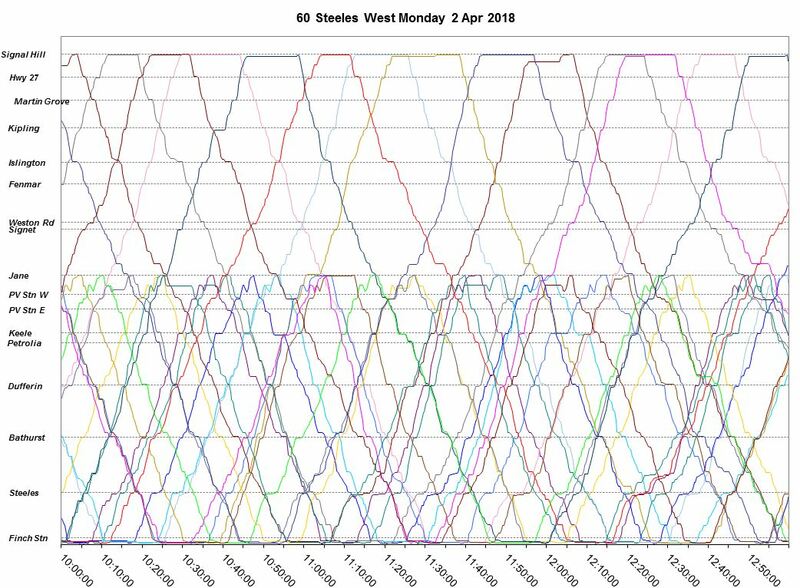 The chart formats here are similar to those in the first article, with one change: the charts breaking data into quartiles have been changed so that each quartile has its own colour making them stand out better. As with the headway data, the behaviour of the route is broken by timepoints or screenlines along the route. 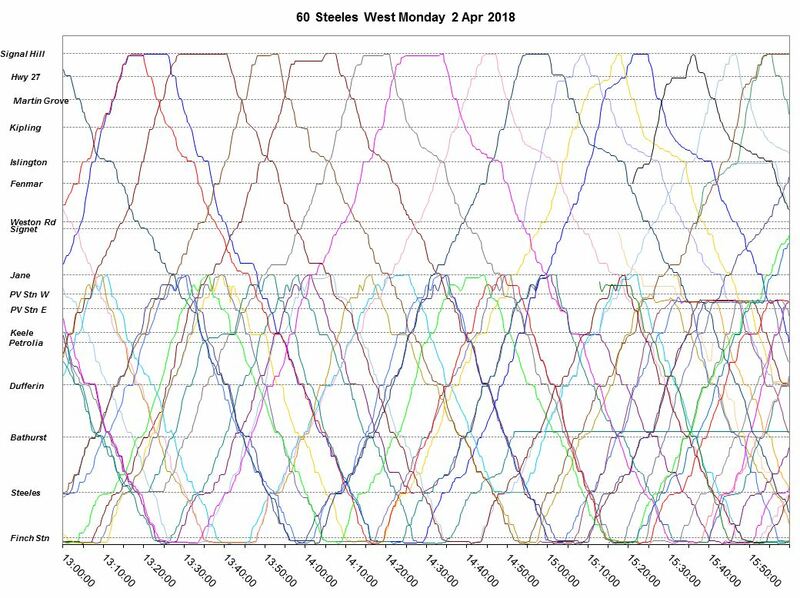 Where the headway charts showed the intervals between buses passing a timepoint, the travel time charts show the time taken between these points, organized by time of day so that the rise and fall is clearly seen. 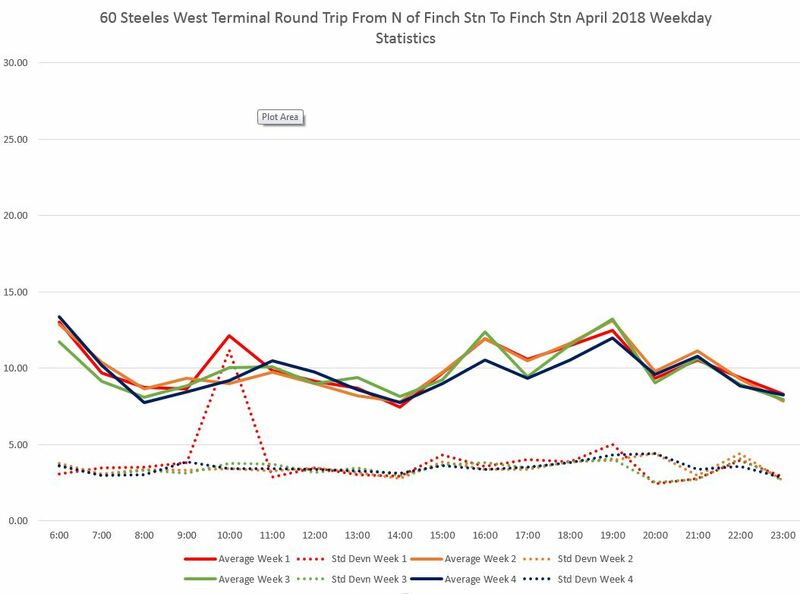 Here are the charts for westbound travel from Finch Station in April 2018. The first page shows the route between Finch and Pioneer Village Stations. 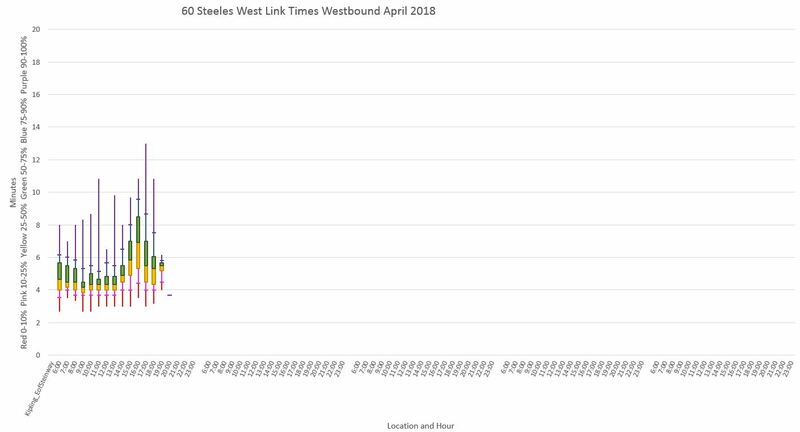 It is no surprise that the biggest peak period effect falls in the afternoon for westbound travel. 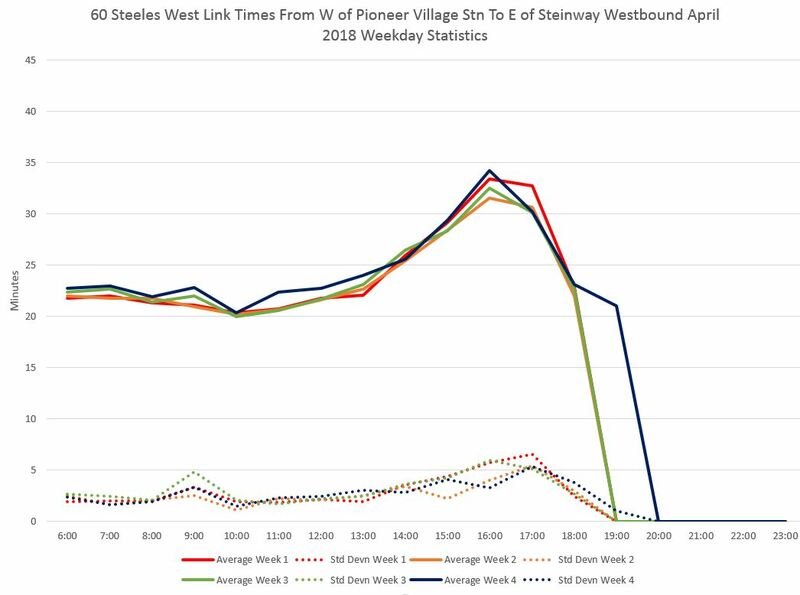 The first section of the chart below shows the time taken at Pioneer Village Station by buses that are continuing through to the west. The segments from Jane to Weston Road, and from Weston Road to Islington also show the effect of PM peak congestion. Worth noting is that some of the peaks are fairly broad with longer travel times showing up well before the “peak” hour in the early afternoon. 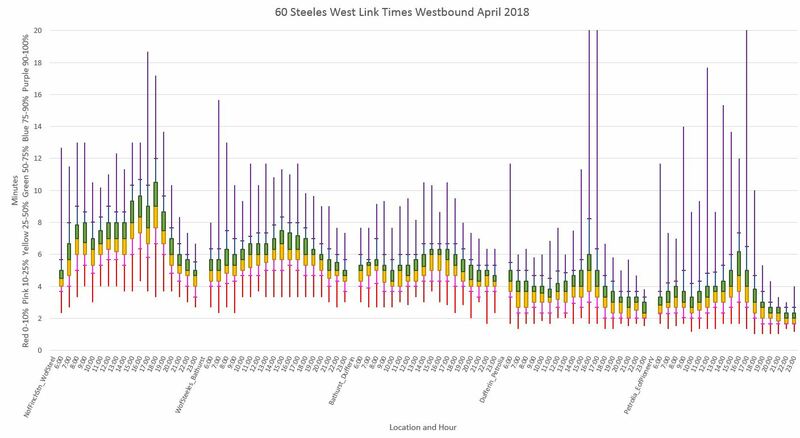 This means that any move to provide better transit priority must address a wider period than an hour or two traditionally thought of as the “peak”. This chart shows the last segment from Kipling to the east side of the loop west of Highway 427 via Signal Hill and Steinway. Note that Steinway is the eastern limit of the on-street loop, and times are measured just east of this location so that terminal layovers are not included in travel times. There is no evening service here. The route’s behaviour eastbound in a few ways notably that there is less of a peak effect in the AM eastbound direction that in the PM. 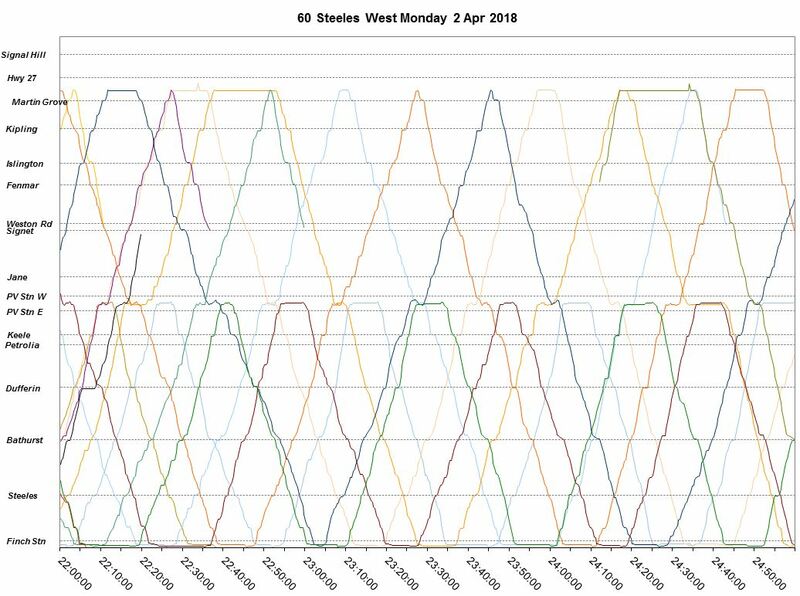 However, from Kipling to Islington there is a marked rise in travel times for both AM and PM peaks. The full sets of charts are linked below. 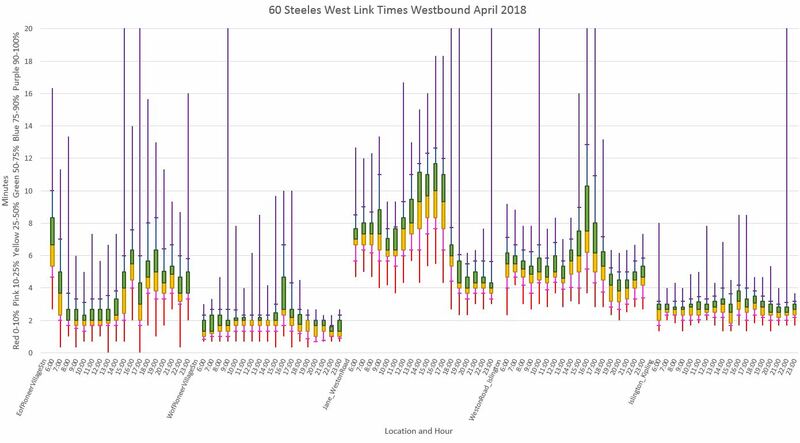 Although the segment by segment times in the charts above are useful in narrowing down the areas where congestion problems are more severe, for comparison with scheduled times, we need to zoom out to longer portions of the route. 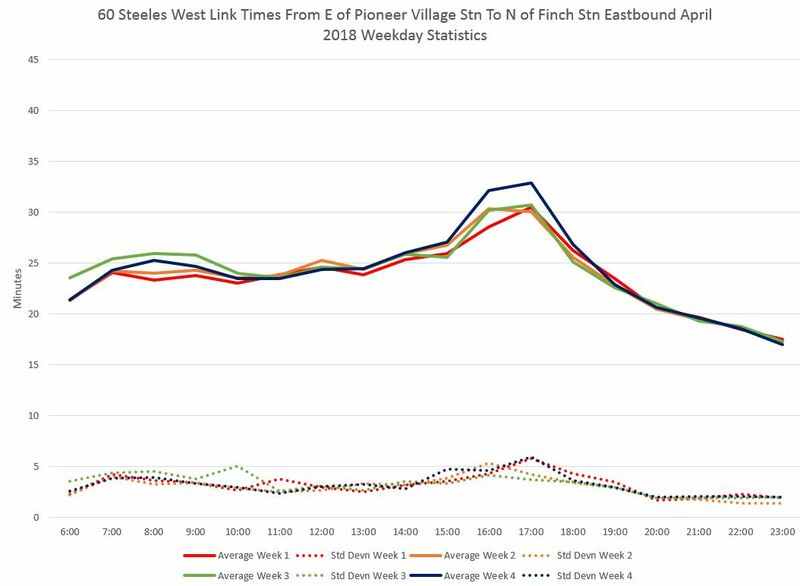 Here are charts showing the average travel times between Finch and Pioneer Village Stations measured from just north of Finch to just east of Pioneer Village. (This omits time actually spent in the stations which can vary considerably.) During the PM peak, the standard deviation can be over five minutes indicating a fairly wide range of travel times. This includes both express and local services, but the scheduled travel times for both of them are similar and I have not attempted to break these trips out. The important point here is that the local service has a scheduled round trip of 83 minutes in the PM peak, and the express service 72. 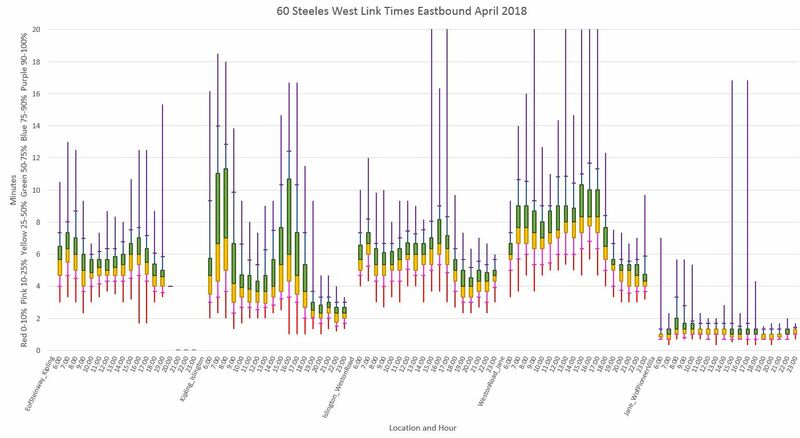 The result is that with a combined peak travel time of about 30 minutes each way, plus 10 minutes at each terminal area, the 80 minute round trip is tight to the scheduled travel time and many trips that are higher than the average will run late. 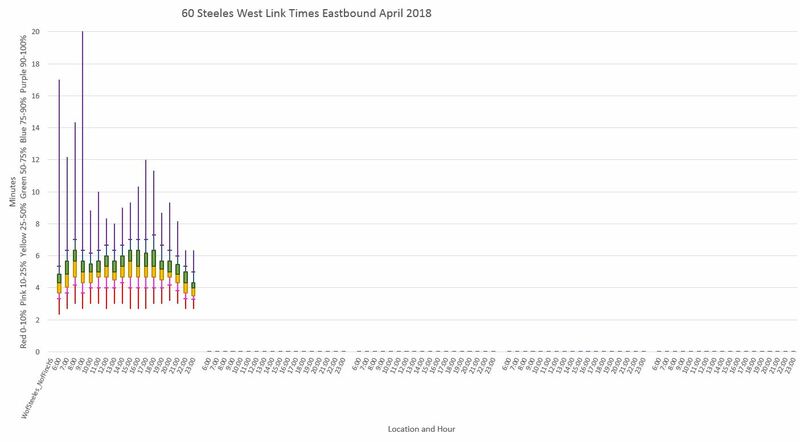 With the implementation of the 960 Steeles West Express, the scheduled round trip time for the local service was increased to 85 minutes, only a small change from the value in April 2018. The express service continues to have a 72 minute trip time. I do not yet have data for the revised operations with the 900-series express routes, and must leave analysis of them for a future article. The western half of the route suffers from erratic headways as seen in the previous article, and it also has locations of considerable congestion. The average travel times on this segment are shown below. The time spent at the Highway 27 loop (via Signal Hill and Steinway) is comparatively small, especially in the PM peak indicating that drivers have no “time to kill” at this location. In this section, I will review one day’s operation on the route to highlight the locations where delays occur. Although a segment-by-segment analysis such as those above flags general areas where there are problems, a more fine-grain approach is needed to pinpoint problem areas. 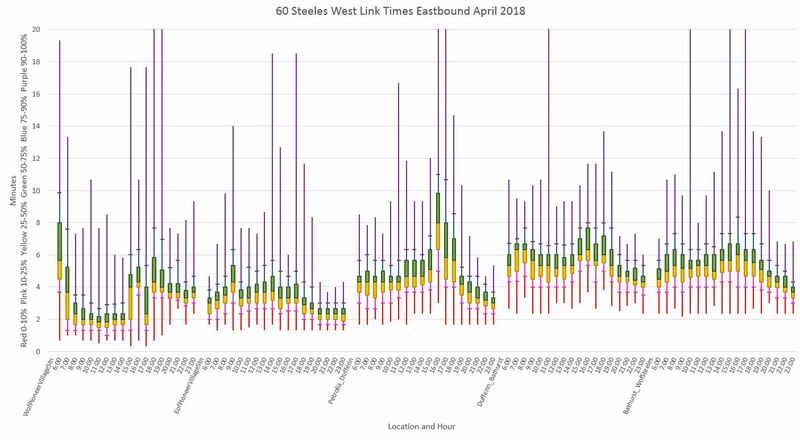 These of course will be well known to regular riders, but it is useful to be able to show them graphically from the data. 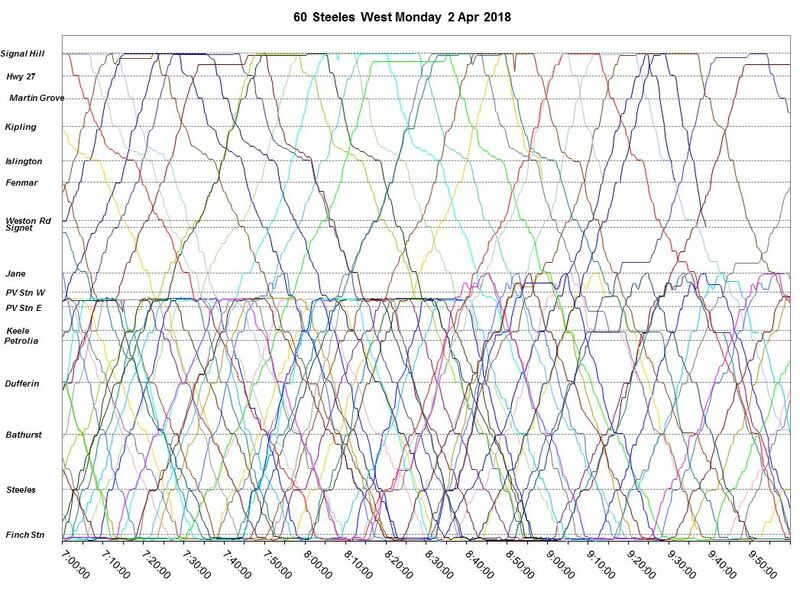 These charts show the movement of buses on the route based on their GPS data. Although the route is not a straight line, its geometry is stretched out (rather like pulling a piece of string taught) so that distances are measured on a common, one-dimensional scale. This can produce some odd behaviour depending on the accuracy of the mapping process (more about that later), but in general this greatly simplifies presentation of travel times and speeds along the route. The more vertical the slope of a line, the faster a vehicle travels – more distance covered in a shorter time – whereas lines that are more horizontal indicate slow portions of the route. A horizontal line shows a bus that is stopped. Lines heading down and to the right are eastbound buses while those heading up are westbound. 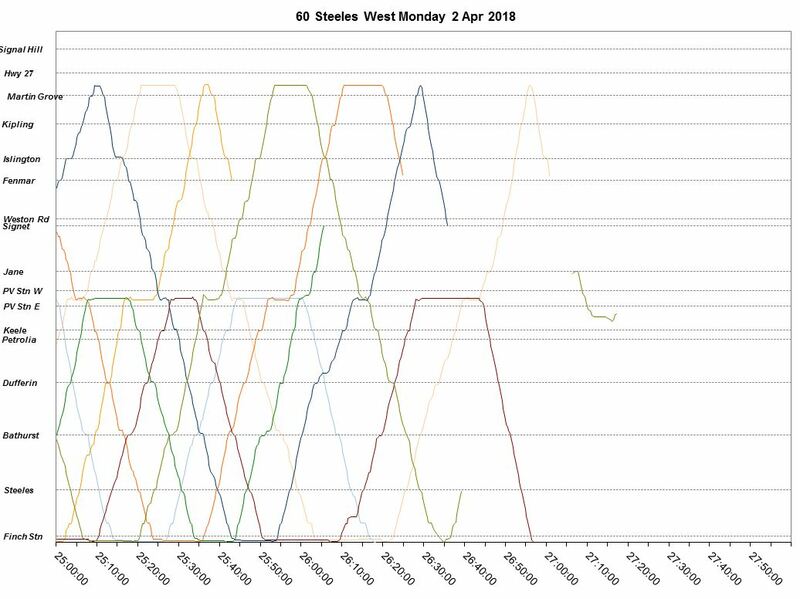 The data shown here are for April 2, 2018 which if anything is a better than average view of operations because Mondays tend to be less congested than later in the week. Even before 7 am, congestion starts to build up eastbound approaching Islington, and the area of congestion grows longer between 6:30 and 7:00 am. Some locations with longer dwell times, either because of busy stops or congestion at intersections, appear early in the day such as westbound at Dufferin and eastbound at Bathurst. Through the AM peak from 7:00 to 9:00 AM, the congestion eastbound at Islington continues. 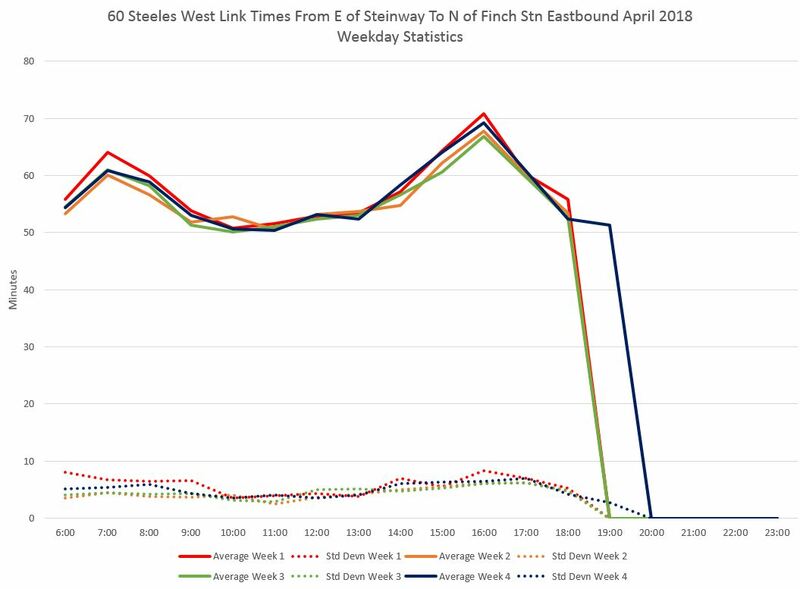 Of particular note here and in later charts is that the primary location of delays between Finch Station and Steeles Avenue is northbound approaching Steeles. 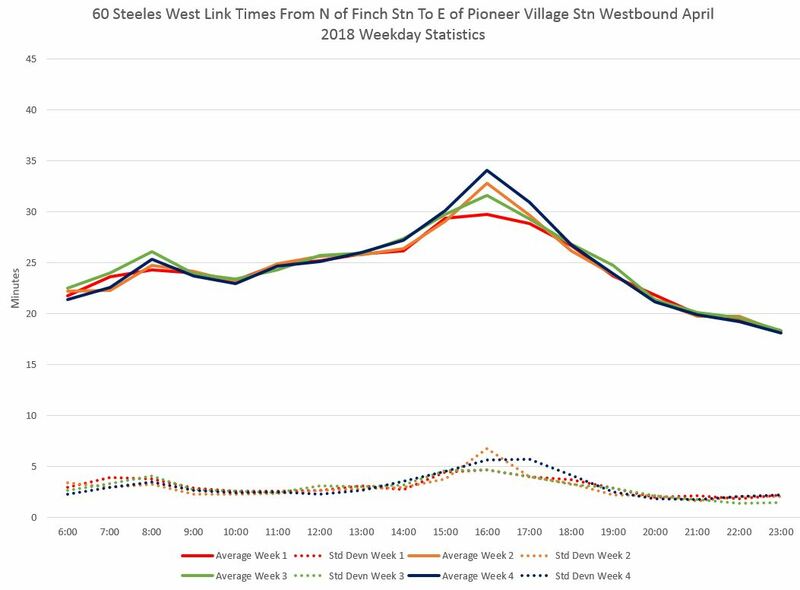 Express trips are visible in this chart as lines that are at a slightly different angle than most of the trips between Finch and Pioneer Village Stations with crossover points where express vehicles pass locals. While there is a slightly faster travel speed, the difference is not large. An important advantage of the express service is to shift the point-to-point demand between Finch Station and York University off of the local service. The strike at York U required buses to loop via an alternate route west to Jane Street. The “map” I used to convert vehicle locations did not deal with the winding path the buses took over this loop. Because this did not affect the analytical process, it was not worth putting in a “fix” for this condition which only affected service at certain time on certain days depending on picket activity. Through the midday, note the bunching of service east of Pioneer Village Station and the uneven service west to Signal Hill. The length of layovers at the west end of the line show that scheduled travel time was not an issue and the unevenness of departures was a matter of driver choice and a TTC standard that allows a six-minute wide margin for “on time” service. Note also that the backlog northbound to Steeles and Yonge continues through the day. In the mid-afternoon, the congestion eastbound to Islington reappears after 1 pm. During the PM peak, congestion at Islington continues eastbound, and more generally along Steeles westbound. These conditions have mostly disappeared by 6:30 pm. Service through the evening has few congestion effects, but headways continues to be uneven. In particular note that the blending between through service to Martin Grove and the shorter Pioneer Village branch is poor leaving both Finch and Pioneer Village Stations, both points where service could be regulated for even spacing. The charts above are available in pdf format in the following link. Providing better transit service anywhere requires a combination of factors and there is no “magic bullet” that will solve everything. 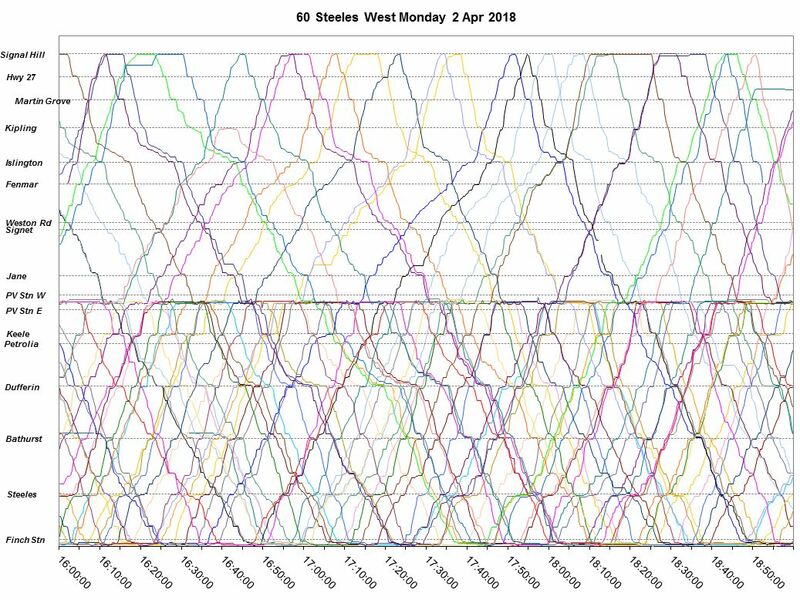 The first and most obvious issue is that service should be capable of handling demand without crowding causing under dwell times at stops or circulation problems within buses. Service regularity can address this in part, but regularity depends on the will to manage service. When the metric of service quality looks only at “on time performance” at terminals, and defines this so broadly that bunched vehicles can be “on time”, there are no red flags or targets for improvement. Locations where congestion or queuing interferes with transit might be addressed with various priority schemes, although the ability to implement them depends on local geometry (is land available for more road capacity and, if so, should the benefit concentrate on transit) or signalling options (will a transit left turn land and priority signal so snarl other traffic outweighing its supposed benefit). Some parts of a route will not run faster because they are not congested today, and the primary source of “delay” is stop service time. Where there is congestion, transit priority can be a hard sell if service is infrequent and the ratio of transit riders to autos is low. Scheduled running times must be sufficient for vehicles to complete their trips, but not so padded that vehicles dawdle on route to avoid being “early”, or that drivers take advantage of the padding for long layovers at terminals knowing they can leave late and make up their schedules. In future articles I will review several other major suburban routes. The issues seen on 60 Steeles West are not unique, although the situation varies from route to route. This entry was posted in Service Analysis, Steeles West Bus, Transit. Bookmark the permalink. Thank for the analysis, Steve. Would you be willing to carry out a similar investigation into a high performing BRT route from somewhere around the world? The intention would be to determine how much TTC bus routes could be improved. Steve: The challenge is to obtain comparable operational data for another service. It is important to note that there is no such thing as “high performing BRT” in Toronto because everything runs in mixed traffic. We have “express” buses, but that really only means limited stops. I frankly tire of how often we see photos of, for example, Curitiba, where the road on which the BRT is implemented is wider than most arterials in Toronto, and where four lanes are taken over for the BRT infrastructure. That type of transit configuration simply would not occur here in some cases due to geometry, but mostly because motorists fight tooth and nail over even a pair of lanes, let alone much more. If “Transit City” had been a BRT network, we would have heard the same complaints about lost road space as we have heard about LRT. Thanks for the analysis for the route, again a lot of things to digest, I guess it goes to show what I regularly experience on that route, especially the uneven headways and your charts do not show the severe overcrowding, which could be helped if more artics were on the route. 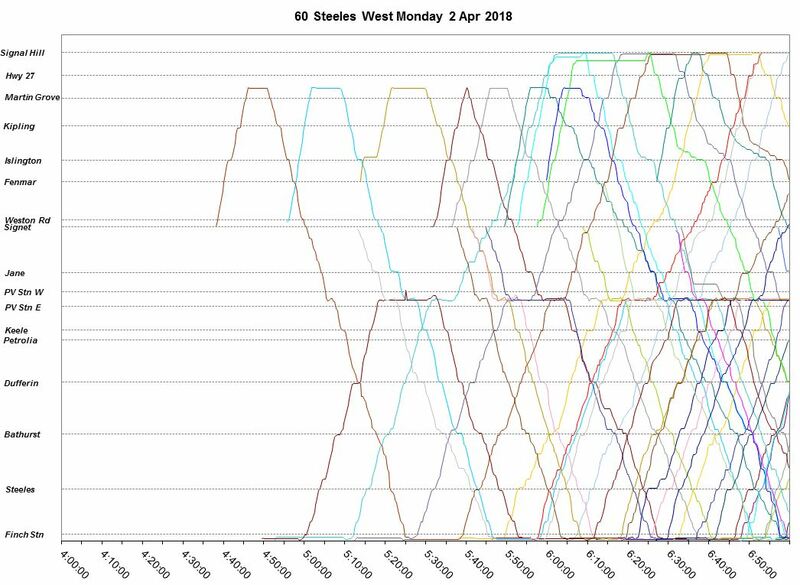 Looking at the analysis for the 2nd of April (I was in the UK then) shows a sizeable gap at Signet Drive at around 3:15 pm about the time I get to the stop. 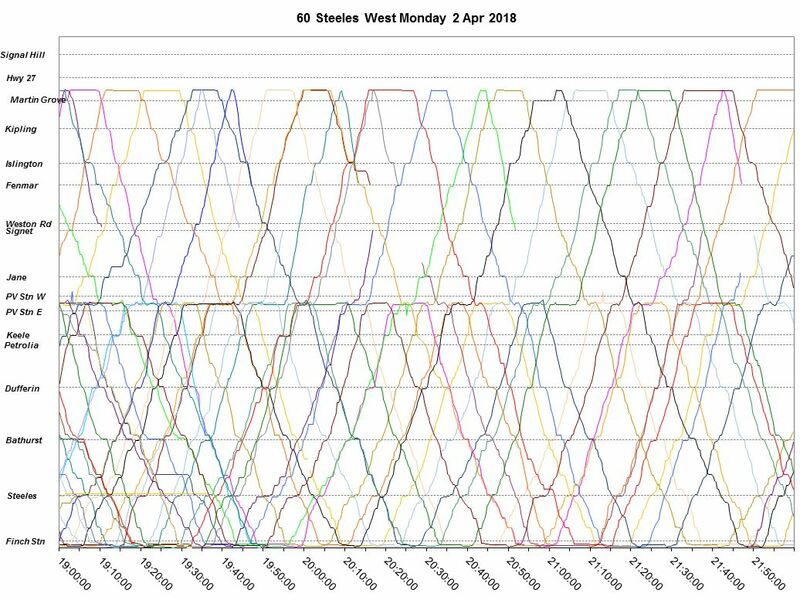 As this was Easter Monday it probably doesn’t show the typical journey times as traffic will be less i.e no school traffic even so still shows how erratic the service can be. Steve: Thanks for pointing out that this was Easter Monday. I will add another day to show one that should have no holiday effects. Yes, there are a few reasons why BRT works in South American countries that do not apply to Toronto. Steve has already pointed out that this would require a large reallocation of street space away from private automobiles. For example, with the excellent Bogota BRT system, the BRT was built into a highway expansion project. Since there is going to be zero highway expansion in Toronto, this model will not work. Also, the capacity of LRT is much higher than BRT. LRT vehicles are larger, and can be connected together to form LRT trains, as is planned for Eglinton. The Bogota BRT was over capacity 10 years ago, and is experiencing very serious overcrowding conditions today. See the excellent 2008 Streetfilm about Bogota’s BRT. The usual solution for an overcrowded BRT system is to upgrade to LRT. This is what happened in Ottawa. However, this is an expensive capital project for a less wealthy city such as Bogota. Also note that union wages in Toronto for TTC operators are much higher than wages in South American countries. So it is cheaper for them to run a larger number of small-capacity buses than a smaller number of large-capacity (but capital intensive) LRT vehicles or trains. LRT makes sense for very wide streets, such as Steeles Avenue, that are seriously congested with buses in mixed traffic. An urban traffic lane can accommodate 600-800 private automobiles per hour. 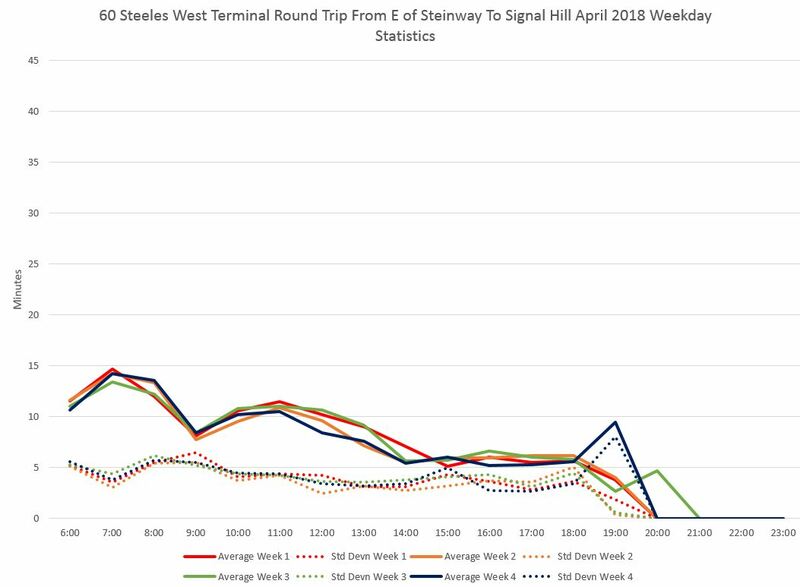 During peak hours, Steeles is probably performing much worse than that for private automobiles due to congestion. As Steve correctly pointed out 10 years ago, a *reasonable* BRT capacity with 60-foot articulated buses carrying 80 passengers each on a three minute headway (20 buses per hour) is 1,600 passengers. But the same lane converted to LRT can now transport about 7,500 passengers per hour. Bottom line: The same lane that is now carrying less than 800 private automobiles per hour during peak hours can be converted to an LRT lane carrying up to 7,500 passengers per hour. Seems like a no-brainer to me. 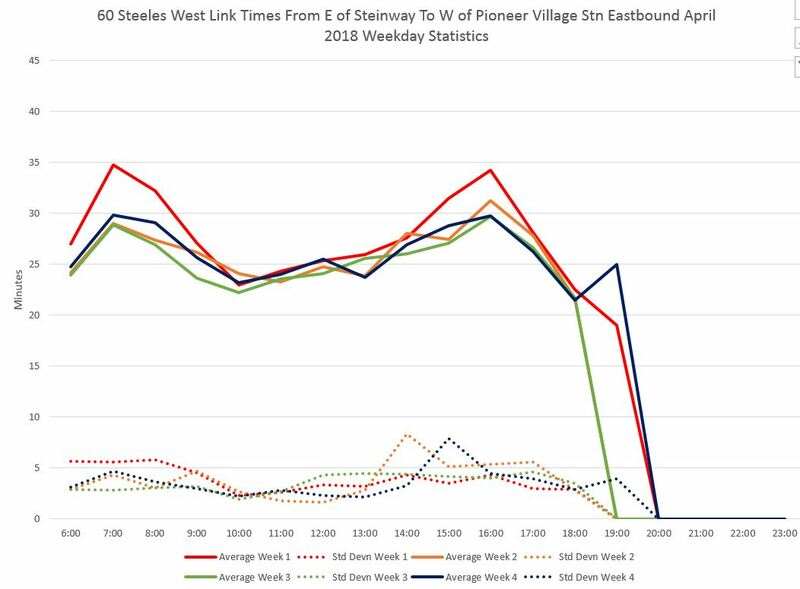 Steve: My only caveat here is that with high volume comes high demand at station locations by pedestrian traffic (either walk-ins or connecting trips from other routes). This has serious implications for street capacity. However, it’s a block-by-block, station-by-station issue unlike the situation with subways where one is committed to high capacity whether it is needed or not. I hope your next analysis would be 25 Don Mills. It would be an interesting study on different route planning implementations and its effects on headway and travel times: Addition of express service compared to local only, splitting the route for shorter route lengths as compared to one long route, and how much travel time is saved when the bus travels on the HOV section as compared to non HOV section. Steve: The routes I have “in the hopper” are the long east-west routes as well as few north-south ones that would be affected by the Spadina Subway Extension. There is a further problem currently with the migration to the VISION tracking system from which I cannot yet obtain data at the level of detail needed for these analyses.